I finally got back to working on The Other Side of the Sky today! For two hours. First time in three months. And even the few days I spent three months ago were themselves the first time in three and a half months, so I think it’s fair to say it’s been six months since I’ve really worked on the book. But that’s not what I meant by more reassurance. No this was reassurance about my mother’s salvation I recounted here the story of how I had one last chance to encourage my mother to believe in Christ the night before she died, and how she seemed to respond, seemed to be saying yes but not in any clear and definitive way. 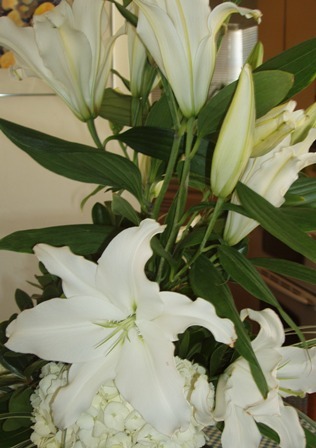 I related how after I’d left her and walked down the long, deserted main hall in the hospital a woman came toward me carrying three white lilies which I took to be God’s confirmation that my mother had indeed believed and received eternal life. There was more of that sort of confirmation afterward. Like me picking up the birthday card my mother had given me in March to put it away (I had it on display) and, in turning it over, discovered that on the back was printed “Lilies of the Valley.” And finding out that her yet-to-be-born great-granddaughter was to be named Lily, a decision my son and his wife had arrived at well before the incident of the white lilies in the hall. But there was another weirder, but even stronger confirmation that I discovered some time after the actual events when I was rereading the entry I’d written in my journal of those last moments on the day she died. Suddenly the names of all her caregivers who were around her that day seemed to leap off the page at me. Dr. Bravo, former nurse Alva (the name means, in Hebrew, “brightness, exalted one“, Mother’s actual nurse of the day, Victoria, the technician Mary, all came to say goodbye to me. And when we arrived at Peppi’s House, the Hospice facility, Mother was delivered over to the care of a nurse named… Christy. Christ. Gave me chills to see all that. Still does. But there was one name I never looked up, that of Dr. Clements who had really been a blessing to me. He was the pulmonary specialist who drained the fluid from Mother’s lungs so she could breathe better and be a little more comfortable. He was the one I could talk to, and did. He always made me feel better, even when things were dire. He was clear, he made it all understandable, he worked with dying patients all the time. He was the one who told me on Saturday that Mother probably wouldn’t last twenty-four hours, the one who wrote the order for Hospice when the brilliant but flaky gastroenterologist forgot. He was the one who told me to call my sister and tell her to come ASAP. Lately I’ve been wondering… what does his name mean? It seems like a plain, vanilla English name. Probably has no meaning, right? Certainly not anything significant like the others. The question kept niggling at me so last night I finally looked it up. That gave me chills, too. This entry was posted in Ailments, Life and tagged cancer, grace, Life on June 29, 2011 by Karen Hancock. Karen, His plan never leaves anything to doubt. Yes, it gives me chills. Mercy and grace…. I love the gifts God gives. A friend of mine says she always sees a hummingbird when she most needs a reminder of God’s love. For me, the cardinal is my reminder that Keren is in His hand and that he loves me. Every detail, huh? Merciful and we all need a good dose now and again. So happy your working on your book even if it is just a little bit here and there.